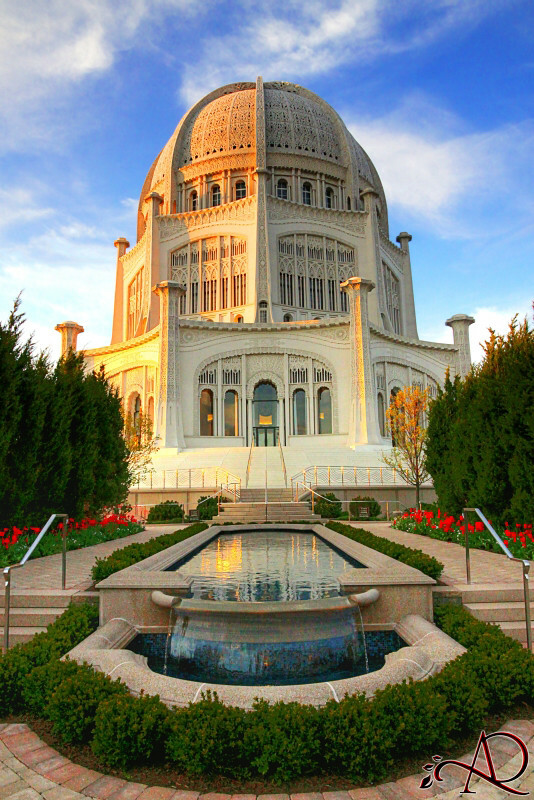 Located outside of Chicago in Wilmette, Illinois, the Baha'i House of Worship is the oldest surviving temple of its kind and the only one in the United States. This unique and beautiful form of faith attracts thousands of curious visitors every year from all faiths and walks of life. Ultimately refreshing, relaxing, and awe-inspiring, the Baha'i House of Worship is a supremely beautiful work of art with a passionate yet peaceful foundation. Baha'i is a little known monotheistic religion founded in 19th century Persia. At the core of all Baha'i teachings is the philosophy that God is at the center of the entire universe, at the center of all faiths. They believe that all the major religions worship the same God under different names, with the ultimate principle being unity. Baha'i followers believe in peace and unity above all, equality through diversity. In the early 1900s, construction began on the United States' own Baha'i House of Worship on a secluded section of serene Lake Michigan north of Chicago. The many portions of the temple took decades to finish, troubled by local unrest. The superstructure of the temple, however, was completed in 1931 to great acclaim. People came from far and wide to see the beautiful white building and even postage stamps featured the impressive visage. The temple wasn't officially dedicated until 1953 and added to the registry of National Historical Places in 1978. Today, the Baha'i House of Worship is a "symbol of the oneness of humanity," as it so aptly proclaims, with its truly breathtaking white stone exterior, striking symmetry, and phenomenal interior design. Whether or not your group practices Baha'i, the temple welcomes visitors to experience that oneness of humanity through the prayer and meditation hours, temple and garden tours, and through visiting the Welcome Center to learn more about the faith and temple.